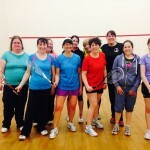 On Wednesday 25th March, the Thurles ladies, coached by Tony Maher, warmly welcomed three visitors from Cork for a great evening of squash. It was great fun and we are looking forward to the return visit in April. 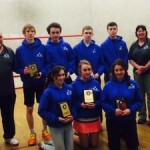 The Munster Schools Squash Girls under 15 Final between Ursuline Secondary Thurles and Ardscoil Na Mara Tramore was hosted by Thurles Squash Club on 26th of March 2015. A very sporting encounter was won 1/3 by Ardscoil Na Mara. Sundays Well traveled to Ennis Highfield A faced Highfield B UCC conceded their match to Thurles as they were unable to field a team on the night. Thurles traveled to Sunday’s Well. Highfield ‘B’ travelled to face the Munster Select team. Celtic travelled to face Silver Springs. Highfield ‘A’ had a BYE this week. The Highfield B team travelled to Ennis to play their match which was postponed at the start of the season. There were no other matches in Division 4 this week due to the St. Patricks Day celebrations.